Keeping workers safe: Does compliance assistance or enforcement work best? It is difficult to evaluate the effectiveness of any given approach OSHA may take regarding occupational safety and health, experts say. 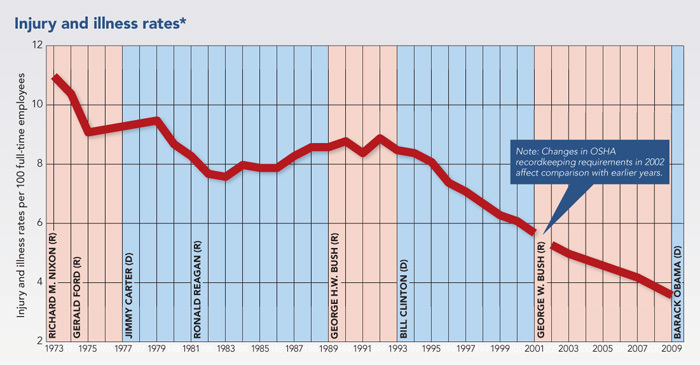 Injuries, illnesses and fatalities have been declining for several years, regardless of the administration in control. 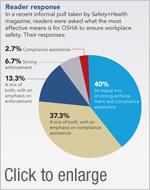 Many people support an approach balancing compliance assistance and enforcement. When it comes to government involvement in occupational safety and health, two schools of thought exist. One: Government agencies should focus on compliance assistance, offering programs to help improve safety in workplaces without fear of punishment. Proponents say if employers see agencies such as OSHA operate more like a partner and less like a law enforcement official, then organizations will take advantage of the programs offered, leading to fewer injuries and illnesses across the board. Two: Government agencies should enforce the law. People who favor this approach say punishing employers who violate safety standards creates an incentive for other establishments to comply with the law. With more organizations improving safety to stay in compliance and avoid fines, workplace safety is improved overall, leading to fewer hurt or ill employees. Generally, these two approaches are linked – fairly or not – to political parties and any given administration controlling the White House. Republican administrations typically are considered pro-business and more willing to support employers with compliance assistance programs rather than focusing efforts on penalties. The Bush administration in the 2000s seemed to fit this description. Compliance assistance programs were expanded, and very few new standards were developed. During that time, Bureau of Labor Statistics figures indicated injuries, illnesses and fatalities dropped, leading proponents of this strategy to call it a success. Democrats historically are viewed as the party for the worker and more willing to come down harder on employers who violate safety standards. During the Obama administration, more inspectors have been hired, more inspections have been conducted and higher penalties have been issued. The most recent BLS injury, illness and fatality data shows yet another decrease, suggesting this method also is successful. 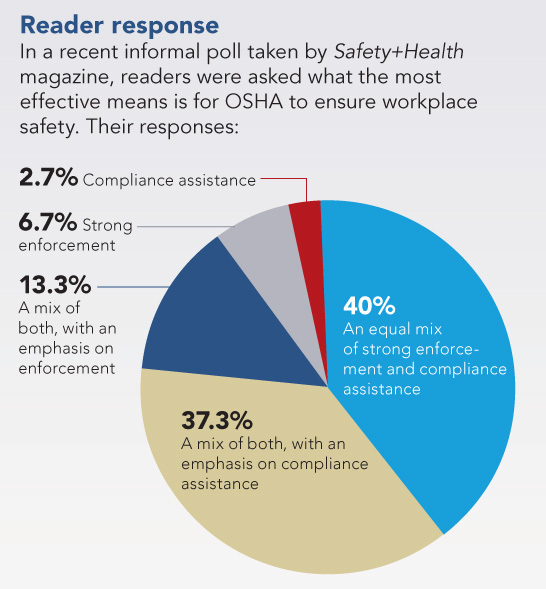 In this year’s annual “State of Safety” report, Safety+Health magazine delves into the ongoing debate between compliance assistance and enforcement, and whether it really impacts injury and illness prevention. Despite the rhetoric from administrations and their supporters and detractors, the truth behind injuries, illnesses and fatalities is anything but simple. With few exceptions (mostly attributed to economic recessions), occupational injury and illness rates have been on a downward trend since BLS began its measurements. For 2009, the year with the most recent data, the rate was 3.6 injuries or illnesses per 100 full-time workers, a reduction of 0.3 from the year before. Fatalities also have fallen steadily year to year. According to preliminary figures, 4,430 fatal workplace injuries occurred (a rate of 3.3 per 100,000 full-time employees) in 2009. This was a sharp drop from 2008, during which 5,214 fatalities occurred (a rate of 3.7). 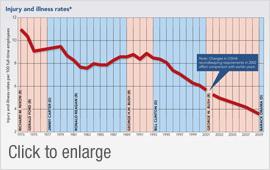 The injury and illness rates provided every year by the Bureau of Labor Statistics are not exact figures, bringing into question how accurately they reflect injuries and illnesses in the United States. Gauging OSHA’s effectiveness may be difficult, according to Ken Kolosh, manager of statistics for the National Safety Council. “You never truly can measure it,” he said. Doing so accurately would require something fairly dramatic, such as removing half the country from federal or state OSHA jurisdiction and measuring the results against the other half still operating with safety and health laws, he said. Because that is not a possibility, officials have to rely on other means to measure the effectiveness of OSHA. Former OSHA administrator John Henshaw said he looked at a variety of key performance indicators during his tenure to gauge OSHA’s effectiveness: injury and illness data, fatality figures, website hits and Voluntary Protection Program members. “I think [these indicators are] the best we have,” said Henshaw, who served as OSHA administrator from 2001 to 2004 and currently runs a consulting firm in Sanibel, FL. But many of these indicators are lagging, coming in two or three years after the fact. Additionally, some figures may be misleading: injury and illness data may be inaccurate due to employer underreporting. (See Recordkeeping results.) In VPP’s case, the program came under fire for relaxing its own standards – some companies who made it into the program had safety records that should have kept them out. In a recent interview, OSHA administrator David Michaels agreed that OSHA’s impact is not easy to assess. “It’s a very difficult issue, and OSHA hasn’t, in the past, really looked at measures of its effectiveness,” he told Safety+Health. Few people in the debate on compliance assistance versus enforcement suggest one is preferred over the complete absence of the other. In a recent informal poll of safety professionals on what they believe is the most effective method for OSHA to ensure workplace safety, most respondents (91 percent) favored the agency taking an approach featuring a mixture of compliance assistance and enforcement. At least one former OSHA inspector disagreed with the idea of leaving enforcement by the wayside in favor of compliance assistance alone. Rick Kaletsky was an OSHA compliance officer for 20 years, and has been working as a consultant for nearly as long. He said although OSHA has “tunnel vision” at times and may hammer employers too hard with citations and penalties, regulations and enforcement are a necessity. “I’m very comfortable and confident in saying that if it wasn’t for the threat of enforcement, then the decreases in significant injuries, illnesses and deaths would not be as dramatic as it truly has been,” Kaletsky said. That threat of penalty works as an important deterrent, Kaletsky said. However, Henshaw cautioned that the threat has to be meaningful, and OSHA needs to be tactful when using it. “I don’t mind strong enforcement, but [employers] also ought to see strong compliance assistance,” Henshaw told Safety+Health. Henshaw served as OSHA administrator under the George W. Bush administration – a period during which, some people suggest, enforcement activities at OSHA waned. Henshaw disagrees with this notion, along with the belief that Republicans focus more on compliance. Henshaw said although penalties under the Obama administration may be higher and the number of egregious penalties handed out may be greater, enforcement under Bush was “just as strong” as the current administration. He noted that any given administration will publicize its particular viewpoint more. “No matter what party is in, they will try to twist the data,” he said. If OSHA enforcement disappeared tomorrow, Henshaw said, companies that value safety would continue to become better and better. Injuries and illnesses are declining for a number of reasons outside of OSHA compliance assistance and enforcement, he claims. 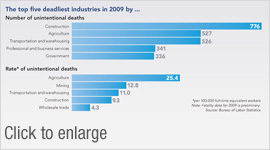 Changes to the economy, manufacturing base and technology have allowed for safer workplaces. The legal system now helps drive manufacturers to build-in certain safeguards to help reduce liability in case someone is injured while using the equipment, Henshaw said. Kaletsky agreed, to an extent. He compared workplace safety improvements to how vehicles are built safer now than in the past, resulting in decreased passenger vehicle death rates. However, “you’d still have a lot more people speeding and getting killed if state police didn’t exist,” he said. OSHA’s agenda typically is set in a couple of different ways. The agency administrator is selected by the president, and the agency generally follows the direction the president would like. However, Congress can put some constraints on the agenda in terms of funding, including how much to provide for enforcement activities or compliance assistance programs. Congress can provide more funding for the hiring of additional inspectors and staff to work on new regulations, and compliance assistance funding can be increased as well. Despite the stronger enforcement posture OSHA is taking under the current administration, Michaels said OSHA balances compliance assistance and enforcement. However, the OSHA chief stressed the budget constraints placed on OSHA have led the agency to be careful with its money. Michaels was appointed by the president, but most of the staff under him are “career” employees – those who were hired, not appointed through a political process. When a change in administration occurs, these individuals go about their job as usual. “Day by day, compliance officers go out and pretty much do the same stuff,” Kaletsky said. “I think a seasoned compliance officer for OSHA is generally not going to let him- or herself be influenced” by politics. Henshaw agreed and offered his own suggestion for political appointees who wind up running OSHA: listen to the career staff. “A lot of the career people have seen what works and what hasn’t worked,” he said.